Our devs have just told us the issue is now fixed. You can now login using your Google details. Was working fine on Friday. 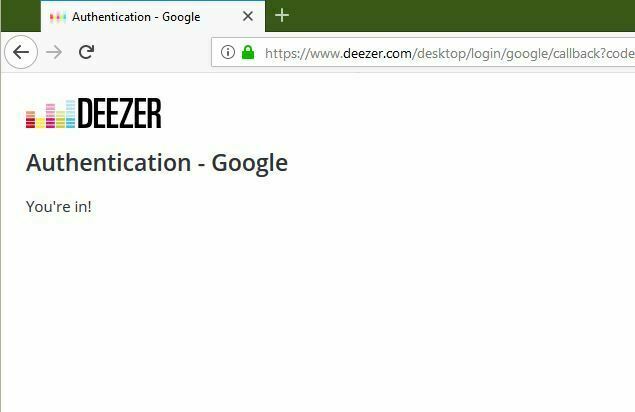 Today I started the Desktop App, proceeded to login with Google account which then opens Firefox browser and I authenticate successful, but then it opens a lauch application dialog with the deezer app selected, and then it returns the error, " This file does not have an app associated with it for performing this action. Please install an app or, if one is installed, create an association in the Defaults Apps Settings page. Hi all! Find problem with google account and desktop app. I tried to auth in desktop app with google, but app open browser in auth in browser and desktop app is still unauth. I cannot log in Deezer with Google account. This is not possible now. Perhaps this topic covers your problem. We're looking into it. I tried to login in with my google account. After I'm directed to the different Browser an log my self in on Firefox I get the message that firefox.exe is not a standard App for this action. On Edge it trys to open the Deezer App, but can't find it. 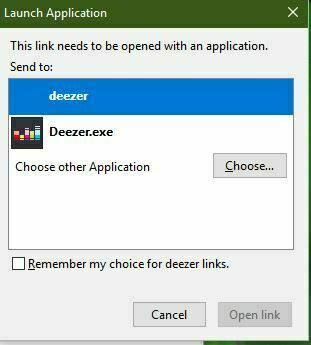 I then become the suggestion to search in the windows store for an App but Deezer is already installed. Any Ideas how to deal with this problem? It's a work-in-progress, thank you for bearing with us. Hi @Rudi , could you please update this topic when bug will be fixed and new version of desktop app will be available?